A Curves Black Flapper Costume including a Dress and Headband – Ideal for a 1920s theme, Gangster theme, or any other fancy dress occasion! Turn heads no matter what the occasion with this fabulous Curves Black Flapper Costume! This Curves Black Flapper Costume comes complete including a Dress and a Headband. This beautiful Curves Black Flapper Costume includes a Black Dress with sheer black sleeves, silver sequins across the bodice, and fringing detail below the waist. Add the finishing touch to this Curves Black Flapper Costume with the matching black Headband, with large Black Feather detail and Silver jewel. Whether for a 1920’s theme, Gangsters, a Murder Mystery theme, Halloween, or any fancy dress occasion, this beautiful Curves Black Flapper Costume will be sure to stand out amongst the crowds. Available in UK sizes Large, XL, XXL, XXXL. 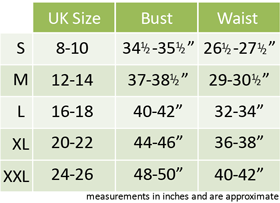 Size guidelines: to fit UK sizes 16-18, 20-22, 24-26, 28-30. A Curves Black Flapper Costume.